We aren’t doing any major bulk cooking this week, but we’ll use planned leftovers a couple of days to reduce prep time later in the week. On Day 1, we’ll use the slow cooker to make Thai Chicken, and you make a double recipe of rice and save the extra to use as the basis of Chicken Fried Rice on Day 2. On Day 4 we are making roasted red potatoes as a side, and using the leftovers in Roasted Red Potato Salad for Day 5. 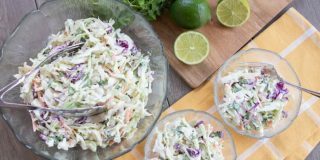 This is a great way to cook more on one day and have less prep the next—and it gives much better flavor than using boiled potatoes in potato salad. Make an extra 3 cups of rice tonight and save for the fried rice on Day 2. Do not pack the rice into the leftover container; store it in something large enough so that you don’t have to pack it down. Place chicken in slow cooker. Mix together all other ingredients except peanuts and cilantro and pour over chicken. Cook on low for 8 hours or on high for 3-4 hours depending on your slow cooker, stirring occasionally. 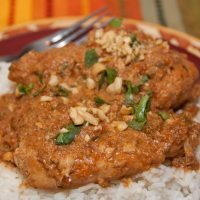 Serve over white rice and garnish with peanuts and cilantro. Use the leftover rice from Day 1 to make the fried rice. This is an authentic version of the fried rice I learned to make (and ate an awful lot of) when we lived in Japan. Heat a teaspoons of oil in wok or on a large flat griddle surface and scramble one egg in it. Remove egg and add some more oil to the pan, and heat. Add onion and sauté for 2-3 minutes. Add thawed peas and carrots and cooked chopped chicken. When the onions are tender, add the rice and stir. Add soy sauce to taste and continue to stir and mix rice so all grains are exposed to the heating surface. Add the cooked egg, chopping to break it up, near the end of cooking time and stir well. When the rice is heated through and a bit crispy, it is ready to serve. 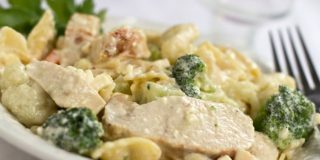 You can use just about any meat in this recipe or add more vegetables and make it vegetarian. 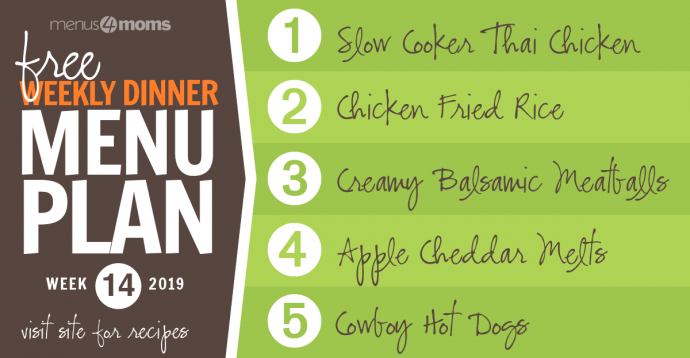 If you want to add flavor (and calories), add a splash of Yum Yum sauce about halfway through cooking. 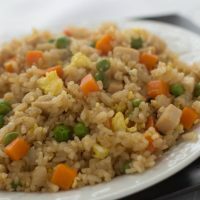 The secret to good fried rice is to rinse your rice before cooking it, and to separate or crumble the clumps of day old/leftover rice before putting it into the hot pan with oil. 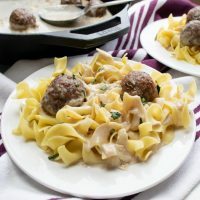 Brown meatballs over medium heat or in the oven; set aside. Heat butter in a heavy skillet over medium high heat. Add onion to pan; cook over medium heat until onions are golden. Add cream and vinegar and cook on low 2 minutes. Add cooked meatballs to pan and cook until heated through. 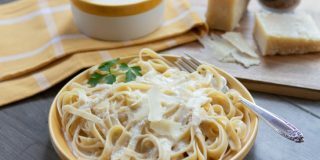 Serve over cooked egg noodles or rice. Noodles are not included in calorie calculation. The recipe for roasted potatoes makes enough to have 2 lbs. of potatoes with dinner tonight and 2 lbs. to use for potato salad tomorrow, so save the extra or go ahead and make the potato salad tonight and refrigerate. Toast the bread. While the bread is toasting, cut the apple into thin slices and mix the apple slices with lemon juice to keep them from browning. When the toast is ready, spread it with the mayonnaise and layer the apple slices on each piece. 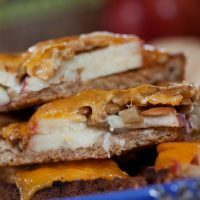 Sprinkle the sunflower seeds on top of the apple slices and top with a slice of cheddar. Toast until cheese is melted. Cut into triangles and serve immediately. 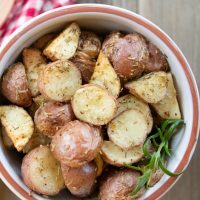 These roasted red potatoes are always a hit and they make amazing potato salad. Preheat oven to 425 degrees. Wash potatoes and half or quarter so that pieces are uniform in size. Dry with a paper towel as much as possible. Add olive oil and toss to coast. Sprinkle with seasoning and mix well. Bake, stirring periodically, for 25-30 minutes or until tender inside and somewhat crisp outside. This recipe makes enough potatoes to serve for a meal and use 2 lbs. 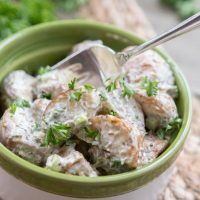 in Roasted Red Potato Salad. Use the leftover roasted potatoes from Day 4 for the potato salad tonight. Grill or fry hot dogs. While hot dogs are cooking, sauté onion in oil over medium heat until browned. If desired, heat buns. Serve hot dogs with desired toppings. 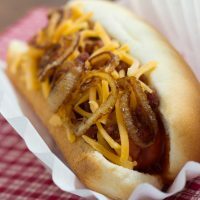 Calories are based on one hot dog in a bun topped with 1 tsp. mayonnaise, 1/6 of the sautéed onion, and 1 Tbsp. shredded cheddar cheese. Mix the mayonnaise and spices together and season with salt and pepper to taste. Gently stir mixture into roasted red potatoes and add green onions and parsley. Serve immediately or refrigerate. The time estimates for this recipe do not include roasting the potatoes. Thanks for YET AGAIN another menu plan. I have to congratulate you on your instructions which optimize cooking time by cooking extra one day so you can use the leftovers — or “planned overs” as I prefer to call them — another day. I prefer to space them out a little bit, though. So the rice from Monday would be used in Wednesday’s dinner and potatoes from Tuesday would reappear on Thursday. I just now noticed your recipe multipliers. However, since we’re empty nesters, I’d love to have fractional multipliers (1/2 or 1/3) for a recipe. Yes, I can do the math myself, but sometimes I’m just lazy and since you have the 2x and 3x, perhaps your routine could accommodate fractions as well.